Have you ever heard of a slosh pipe? Well, heard of it or not, let’s talk about how to build a slosh pipe! 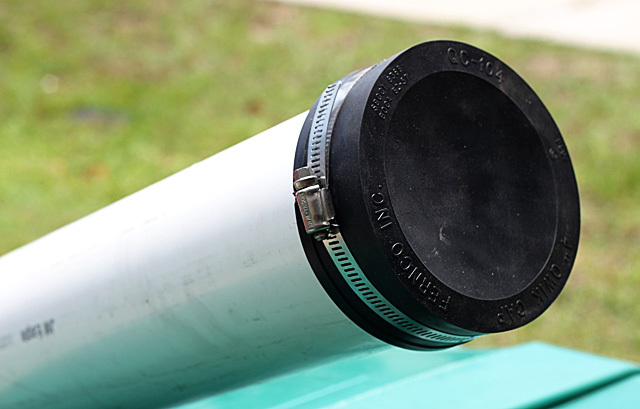 A slosh pipe is simply a PVC pipe filled 2/3 with water. The term “slosh” is used because the water sloshes around inside the pipe – which makes this apparatus very challenging to move around. Here at End of Three Fitness we have a myriad of different projects you can pick from. 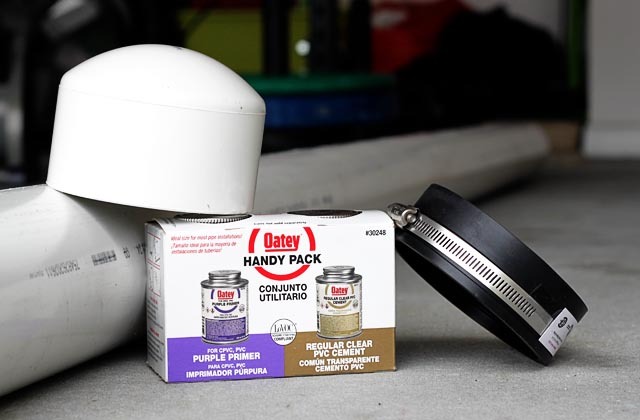 Some Eo3 DIY projects will take a large portion of your weekend, like the DIY Jerk Boxes, and then there are projects like the 36-second kettlebell which are quick and easy. The DIY slosh pipe comes in at one of the quickest, cheapest and easiest DIY projects you can do, and I highly recommend it – because you will get the biggest bang for your buck with a DIY slosh pipe. This puppy has the ability to challenge every muscle in your body, and a lot of muscles you don’t even know about, or rarely use. Personally, I am not a huge fan of traditional sit-ups and crunches for strengthening my core and prefer stabilization exercises to get the job done. The slosh pipe will do just that, and much more. It can work on stabilization muscles in the core, your arms, back, chest, etc. Basically you can use the Slosh Pipe for any exercise you can do with a barbell. 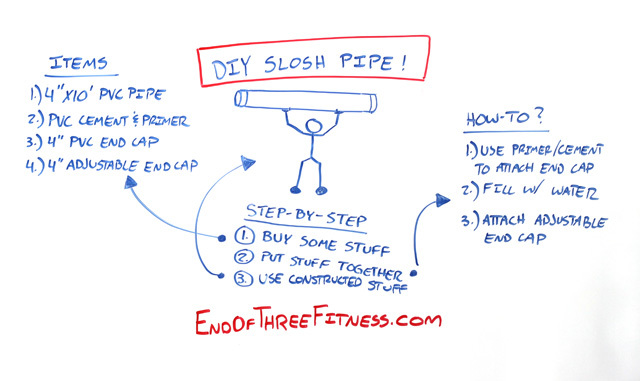 We can talk more about benefits in a minute, let’s go over how to build a DIY Slosh Pipe…it’s insanely easy. Time: Including time for PVC to dry…One hour. First, decide on what size you want. I built, and recommend, a PVC pipe that is 4 in. diameter and 10 ft. long. It makes it easy because you can buy it that exact size and avoid any cutting. Depending on YOUR size and strength you could also do a 3 in. diameter pipe and vary lengths at 6 ft./8ft., etc. I know some people who go even wider in diameter, it really is up to you. I like the size I have and it is very challenging to use. You can always add or take away water in the pipe to make it harder/easier to use. No matter the size, the instructions are the same. 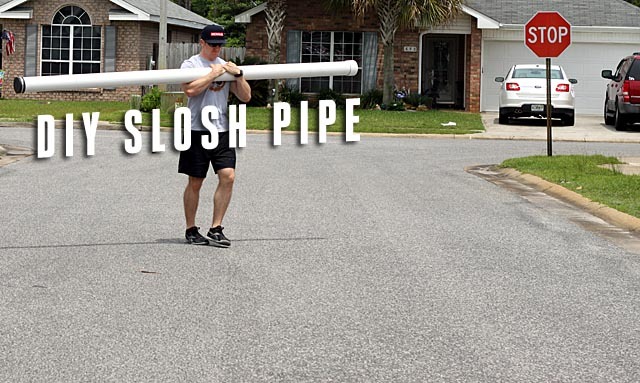 Alright, don’t blink or you’ll miss how to build the DIY slosh pipe. Got your DIY Slosh Pipe materials? Nothing tricky here, follow the instructions on the back of these two cans and you will be just fine. Make sure that you get the PVC all the way seated inside the cap. Standing the pipe straight up will provide enough pressure to make sure it is fully seated. Just watch out for any spill over from the PVC cement. Make sure you let the PVC cement fully cure before you start to add water. You waited long enough for the PVC cement to dry, right? Good. Now, add water. How much water should YOU add?? Keep in mind you only want this thing to weigh roughly 40 lb. I added too much water at first and was somewhere around the 55 lb mark and, let me tell you, a 55 lb slosh pipe danced me all around my front yard and up and down my street. I let some water out to get it to 40 lb total weight. Keep it simple. Just weigh how much your PVC materials are then after that each gallon of water you add will be an additional 8.34 lb. For my slosh pipe, that came out to around 4 gallons inside the pipe. See what your comfort level is. The weight of the pipe is significantly different if you made a 10 foot slosh pipe as opposed to an 8 foot pipe. Just play with it until you get it right. For me, a 10 ft., 4 in. diameter slosh pipe weighing roughly 40 lb. is perfect – not too easy and not too tough. *Optional – add a few capfuls of bleach to make sure the water doesn’t get gross. Not much to talk about here. Make sure the rubber is seated and flush on the PVC then tighten it down. Next, it is time to use this thing! I could have used the photos where I had this thing perfectly level and no weird grimace on my face, but that would be misleading. A slosh pipe is no walk in the park, especially if you are not accustomed to stabilization exercises, or if you put too much water in at first…like me. Core stabilization is HUGE! Being able to properly stabilize your core can aid in injury prevention, improve your balance, and even reduce blood lactate levels post workout to help you recover better and reduce soreness. It really doesn’t matter what you are doing with a slosh pipe, if you don’t want to drop it you will learn to stabilize every muscle in your body. All muscles…little tiny muscles that will scream at you the next day, and really large muscle that will be sore just from the confusion of all this. 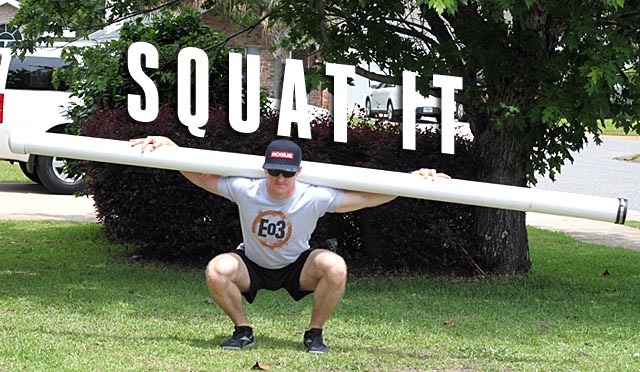 You can do anything with a slosh pipe; you can bench press it, overhead press it, squat it, deadlift it, lunge with it, or just walk with it on your back. It’s all good, but the number one thing I recommend…. The Zercher Slosh Pipe Walk. The picture at the beginning of this post is the Zercher walk. Cradle the slosh pipe in your arms and just talk a stroll down the street. Honestly, you will look a little like a drunk person when you first start, as you may stumble around quite a bit, but don’t worry, it gets better. Have you ever tried a Slosh pipe, or will you? Let me know about your experience in the comments!